I am not an anxious person. I do not, generally, worry about things. I am seldom afraid. There are, of course, exceptions. There was the time I was camping by myself in a remote, mountainous area of New Mexico, a place where I would not have expected to encounter any other people at all, and in the middle of the night heard angry, hostile voices arguing not far from my tent. There was the approach to the Katmandu airport, through the mountains and heavy turbulence, when it seemed like the pilots didn't really know what they were doing, and the Buddhist monk sitting next to me began to finger his prayer beads feverishly, chanting to himself. There was the time on the Mekong river in Laos, when my boat hit a rock in some rapids and started leaking fast, and I couldn't attend to the hole or steer for the riverbank because it was all I could do to navigate the rapids, and I thought I might sink before I got through. And then there are the times like tonight. Yes that's right, this very night. 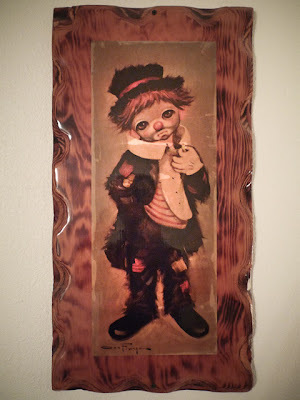 When a howling blizzard stranded me in a tiny little town in the middle of nowhere in Nevada, and I checked in to the Clown Motel. You thought I was joking, didn't you? You want to see what's hanging above my bed? Wait, didn't I see this in a horror movie once? Stranded by blizzard? Small, isolated town? 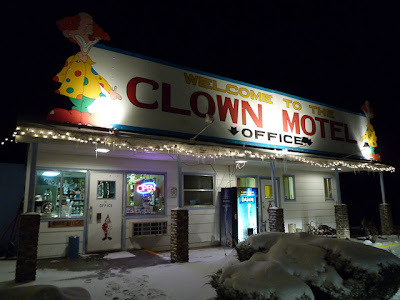 CLOWN MOTEL??? Oh yeah. What could possibly go wrong. Just don't take a shower. Oh my sweet Lord!! Ben, you are a brave, brave man. I would have slept in my car and asked God to keep me from freezing until morning. You'll have to tell me more about this episode in your travels sometime. I'd love to hear it in more detail - at least, the writer in me would.